The International Artist Association is an international friendship association consisting of floral artists. We make flower arrangements as a new form of Japanese culture around the world, such as Hawaii, NY and Paris. Please enjoy our floral parade! We are an international friendship organization made up of flower artists. We perform a new form of Japanese culture around the world including Hawaii, New York and Paris. Please enjoy our flower dance, a neo-Japanese style performance. International Flower Arrangement Association is one of the international friendship associations that mainly consisting of floral artists. 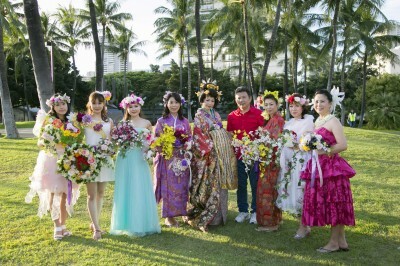 Every year, they are performing flower arrangement as a new form of Japanese culture in various countries such as Hawaii, New York, Paris and others. Please enjoy their flower dance led by Shiori Sakai, who is a Japanese actress. International Flower Arrangement Association is one of the international friendship associations that mainly consisting of floral artists. They perform flower arrangement as a new form of Japanese culture around the world. Please enjoy our hula directed by Maiko Kobayashi, which was performed at the Carnegie Hall on last year’s December. Along with the –eco flower– Preserved Flower International Design Contest, we would like to introduce and have all of you from various countries enjoy this new form of Japanese floral art. What are the favorite colors of the people of Hawaii? Our designers will keep that in mind and create beautiful works of art for the people of Hawaii. Please visit and enjoy the exhibition. We will once again hold the –eco flower– Preserved Flower International Design Contest this year. Every year we host an event to introduce this new form of Japanese floral art to not only the people of Hawaii but also to those of the U.S. mainland and other countries. Everybody has enjoyed and appreciated our art. What are the favorite colors of the people of Hawaii? Our designers will keep that in mind and create beautiful works of art for the people of Hawaii. Please visit and enjoy the exhibition. We will once again hold the –eco flower– Preserved Flower International Design Contest this year. Every year we host an event to introduce this new Japanese flower culture to not only the people of Hawaii but also to those of the U.S. mainland and other countries. Everybody has enjoyed and appreciated our art. What are the favorite colors of the people of Hawaii? Our designers will keep that in mind and create beautiful works of art for the people of Hawaii. Please visit and enjoy the exhibition. We will once again hold the –Eternally Blooming Flower– Preserved Flower International Design Contest this year. Every year we host an event to introduce this new Japanese flower culture to not only the people of Hawaii but also to those of the U.S. mainland and other countries. Everybody has enjoyed and appreciated our art. What are the favorite colors of the people of Hawaii? Our designers will keep that in mind and create beautiful works of art for the people of Hawaii. Please visit and enjoy the exhibition. We will hold an Eternally Blooming Flower, Preserved Flower International Design Contest again this year. 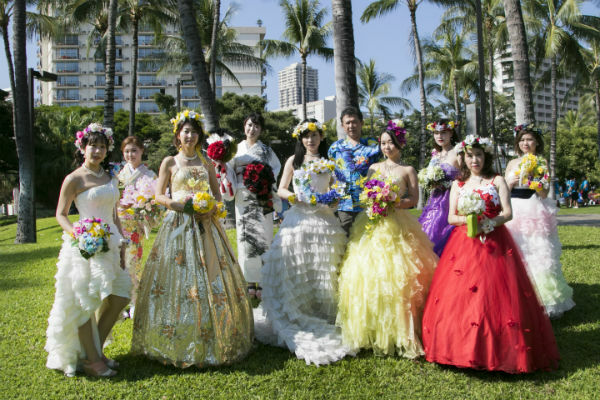 Every year we host an occasion like this to introduce this new Japanese flower culture to not only Hawaii but also to the US mainland and other countries. Everybody has enjoyed and appreciated our art. We will exhibit flowers created by our designers, which have been thoughtfully created by selecting the best colors that will be appreciated by the people of Hawaii. Continuing from last year, free hands-on lessons will also be held starting at 11:00 on both days, 15th and 16th. Each session lasts about 30 minutes and is on a first-come-first-serve basis. 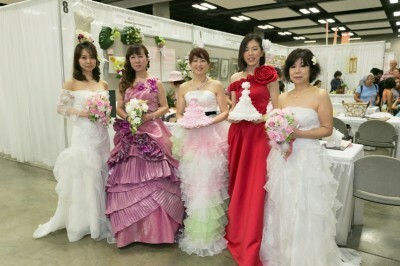 Also this year we will exhibit a bride’s keepsake: a bridal bouquet collection in the lobby of the Sheraton Waikiki Hotel. So please visit and enjoy the exhibition. Continuing from last year, free hands-on lessons will also be held staring at 11:00 on both days, 10th and 11th. Each session lasts about 30 minutes and is on a first-come-first-serve basis. Please come and enjoy the art of preserved flowers in various designs, also called eternal blossoms. 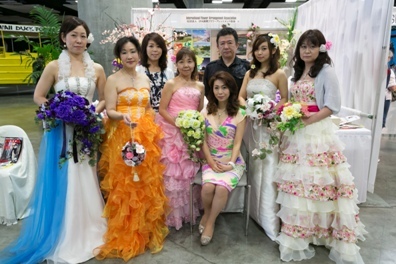 A preserved bridal bouquet contest will be held for the second time.